Sweet Street Passion Mango Cheesecake, 14 Slice -- 2 per case. 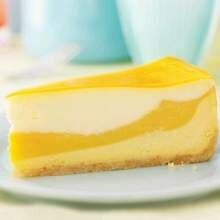 Sweet Street Passion Mango Cheesecake, 14 Slice -- 2 per case. Layers of creamy, smooth passion fruit- and mango-infused buttermilk cheesecake topped with tart passion fruit curd. Finished with a shimmering glaze of passion fruit and mango. If you have any questions about this product by Sweet Street, contact us by completing and submitting the form below. If you are looking for a specif part number, please include it with your message. Sara Lee Bistro Collection Lemon Lover Fruit Dessert Bar, 44 Ounce -- 4 per case.